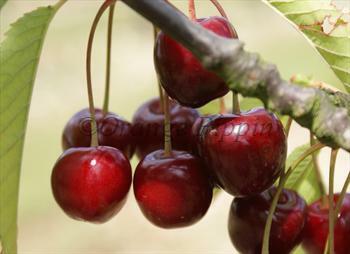 Regina is a modern late-season black dessert cherry, ripening in mid-to-late July. Although usually classified as a black cherry, in practice the colour is more often very dark red. The flesh is firm, dark red, with an excellent flavour. Regina often ranks well in consumer taste tests, for appearance and flavour. Regina has quickly proved popular with both commercial growers and gardeners alike, on account of its good balanced flavour, large size cherries, and resistance to fruit-cracking. Please fill in the details below and we will let you know when Regina cherry trees are back in stock. An excellent mid-season cherry, and a good pollinator for Regina. Stardust is a new mid-season white cherry which is also fully self-fertile. Regina is in flowering group 5. Regina is self-sterile and needs to be pollinated by another tree of a different variety nearby. Regina has some resistance to cracking and splitting, a common problem with sweet cherries, caused by rainfall at the time of ripening. Regina is not self-fertile and requires a compatible cherry tree nearby to ensure pollination - Stella or Skeena are good choices. Cropping is often better in cooler climates than warm climates. Regina was developed in the 1950s at the Jork Fruit Experiment Station, Hanover, Germany. It was released in the 1990s. Regina is a cross between two other German cherry varieties, Schneiders Spate Knorpelkirsche and Rube.